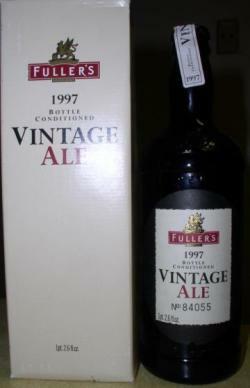 Brewed on 18th May and 22nd July 1997 this is the first in the portfolio of Vintage Ales. Dark in appearance, the taste is almost brandy like with a hint of fruitiness in the aroma. Bottle #47403. 550ml. Open: small hiss, no frothing Pour: thick, good head Nose: raisins! Appearance: cloudy Taste: still thick, dried fruits, figs, Christmas cake, hint of orange, still sufficient carbonation A sublime beer even after 21 years in the bottle. Thoroughly enjoyable. (500ml bottle) clear brown, fine tan bubbles. Nose is mildly oxoidized, but appropriate, caramel, cream, still seems fresh. Taste of caramel, oxidized, cream, lightly fruity, dates, raisins. Medium carb. Bottle number 14110, which I came across in a chest of drawers while clearing out my father’s garage. It poured clean and clear, mahogany coloured, with a momentary, off-white, head and touch of carbonation. The aroma was rich, with plenty of fruitcake notes, a touch of oak, warming alcohol but no hop character remained. The flavour was sweet and boozy, with plenty of berry fruits, nuts, a yeasty edge and warming, rich finish. Almost 18 years after it was brewed, this was a great beer. Cheers John! Backlog rating. Colin Brings The Goods tasting at Kernel tap room, London. It pours a murky dark amber/brown color with no head to speak of. Aroma is sweet and robust, oxidised with notes of cardboard and dust. But figs, raisins, toffee and caramel notes are still there. Taste is straight up sweet with more toffee, figs and ripe fruits, more cardboard and dust. Light bodied, thin and quite flat. Body is not the strength of this beer, not anymore at least. Overall, very interesting to this this odd rarity, many thanks Colin. I have to say this was anyways better than expected after all these years. Bottled 550 ml at Akkurat, Stockholm, on August 7, 2014. Clear brown color, tan head. Sweet, raisin, coca-cola, alcohol, some juniper, sugary, honey, berries, chocolate, candy, cocoa scent. Sweet, mellow, alcohol, raisin, smooth, dry chocolate taste. Cocoa aftertaste. Smooth mouthfeel, low to medium low bitterness. Warming alcohol. Smells very nice, taste seems a bit tired, really feel this is now over the top and likely have been better to how I would appreciate it. Still holds up very well though. Bottle split at Bruce’s pad, thanks to Mads (Dedollewaiter) for the trade, 12/05/14. Bottle #61154. Marmalade orange/amber with a moderate light beige swirl and accompanying edgework. Nose carries sherry tones, bloody mary, oxidised pangs, dark malts, toffee, spice, light must. Taste comprises toffee fudge, earthy, oxidised licks, dark stoned fruits, bread pudding, dates, prune juice, sherry twinges. Medium + body, fine carbonation, semi drying close with a light streak of booze. This has held up really well for 17/18 years, clear oxidisation but still drinkable and enjoyable. Big thanks to Colin for sharing this. It poured a muddy brown. Big dark fruit - figs, prunes - aroma. Light to medium body. Sweet and sour, with lots of dark fruit and some toffee. Old and interesting.